I Can’t Stop Eating So Much. Please Help! I Can’t Control What I Eat. I’ve Failed Each Time I Tried. Does this sound like you? Do you sometimes feel that you’ll never get rid of your compulsive eating disorder or food addiction? One of the main reasons overeaters fail to change is that they simply believe they can’t stop eating so much. It’s that simple. If you want to eat normally, you have to build the belief that you can. If you fail to do so, the belief that you can’t change will control you, and you’ll keep on eating too much forever. I know it’s probably the first time you are hearing this. Everybody else seems to be talking about eating mindfully or intuitively. This can help, but if you have a “limiting” belief like “I can’t change” blocking your way, these techniques will be hard to apply consistently. Start believing that people can stop overeating. Question the thought that you can’t. Start building the belief that you can. If you have a long history of going back and forth from dieting to binge eating back to dieting and so forth, you have probably reached the conclusion that no matter what you do, you just can’t change. You’re still trying, but deep inside you just don’t believe you can. Maybe you still have hope but not enough to really change. Maybe you believe you can’t because something bad will happen. This is more like fear of change, and I’ve covered that in my article conquer your fear and stop eating so much food in four easy steps . This current article is more about the belief that in your unconscious you don’t believe you can change your eating habits. An incredible amount of evidence has piled up throughout your life that you can’t change, and the more you eat compulsively, the more you add to that pile. In that light, the possibility of making a permanent change in your eating habits may seem even more unlikely. However, the truth of the past doesn’t matter. You always have the capacity for change within you (Tweet this). In other words, what is happening is that your ego believes your present is determined by your past. Fortunately, that is far from the truth. From now on, your goal is to challenge your ego’s belief. To do so start by reading success stories. Find books about people who have overcome compulsive eating. In the forums you visit, only read success stories; filter out the others. And, while that will probably not be enough, it will be a great first step. What you want is to add to the pile of evidence that it is possible to change. 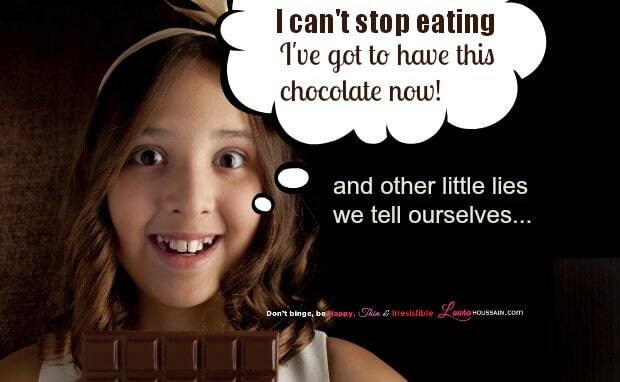 Most compulsive eaters tend to focus on why they can’t, won’t, and haven’t changed. Don’t fall into that trap. From now on just listen to why you can change; and that starts with reading testimonials of people who have changed. Do that regularly. Challenge the idea that people are a result of their pasts, that human beings never change, that it can’t be done―and you can do it. If that is not enough, read books about other types of addiction recovery. I want you to start thinking, “If a heroin addict can do it, maybe I can, too.” If you get a chance to become friends with someone who has fully recovered from an addiction, get to know them, observe how they live their lives, and learn what they did. I, for example, have fully recovered from love addiction, sugar addiction, and a cigarette smoking addiction. I believe that the same principles apply to all addictions. Addictions serve one purpose: to keep you away from yourself (tweet this) and your emotional pain. It doesn’t matter what type of addiction you have. You have it because you want to avoid some form of pain. Anyone who has fully recovered from an addiction can serve as a role model for you. They have broken their old patterns and found new ways to handle their emotions, and you can learn from them. Choose someone who seems to be handling her life with ease and peace of mind, and accept her imperfections. These are usually good signs of addiction recovery. Ask as many questions as you can and observe them, the words they use, the way they walk and stand, and how they interact with people and try to get in their shoes. This is one the simplest ways to stop eating so much without struggling. Find a role model and learn from them. Now that you have some proof that other human beings just like you have been able to let go of their addictions and live peaceful, fulfilling lives, you’ll want to transfer that belief to yourself. To do that, start questioning your thoughts. When you hear yourself think “I’ll never make it. I’ll never change,” start asking questions: Is that true? How did I learn this? Are all these people I read about better than me? Who says so (my mother, my father, my four-year-old self…)? Then ask yourself, “Could I (they) be wrong?” and patiently take note of your thoughts. This simple exercise is very powerful. The more you use it, the more you’ll be able to dissolve the belief that you can never recover. You have doubted all your life that you can eat normally. Now you can start doubting that you can’t. 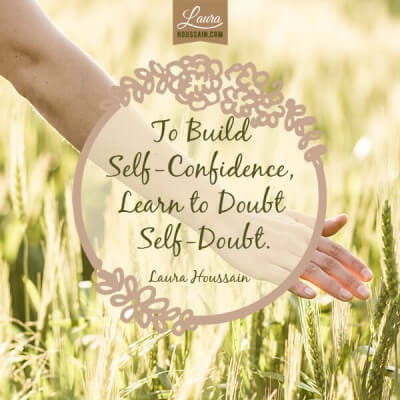 Keep questioning your doubt in yourself and in your ability to change to help you. 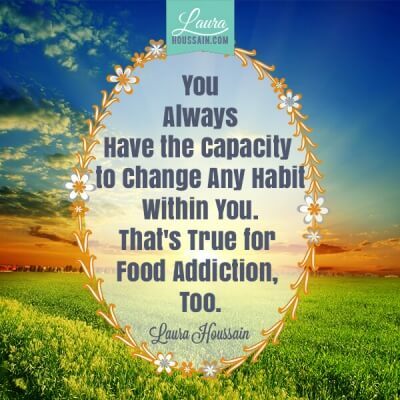 Now that you have created a strong belief that people can recover from any form of addiction and you have challenged the thought that this didn’t apply to you, you should reinforce your faith in your ability to eat normally. I cannot cover all the ways you can do that here, but one way is to acknowledge your progress. It is so easy to forget how far you have traveled and only focus on the long road that lies ahead. Take a moment right now and try to think of the person you were ten years ago. Did you change? A little? A lot? If your eating habits haven’t changed, what has? Do you treat yourself better? Did you learn new ways to handle your emotional pain? 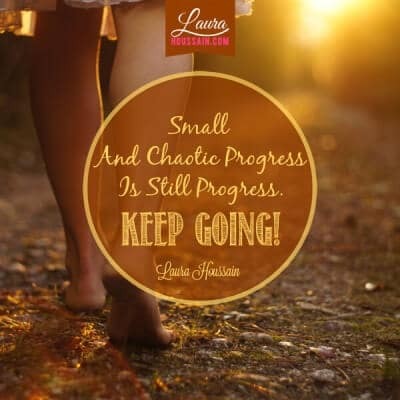 If you are not happy with your progress or the speed of it, I can help you get results much faster than conventional therapy; but for now, please just focus on your progress. If you don’t see any progress, then you can make the decision to commit to yourself like never before and progress more in the next three weeks than you have in the last ten years. If you’re happy with your personal improvements, write each of them down. Add to your improvement list, and read them every day for 21 days. There is much more you can do to help you believe that you can eat normally for life. Unfortunately, that is all I can cover here. The secret is to acknowledge your progress, congratulate yourself, and learn how to love and support yourself in ways that are much more fulfilling than just suppressing pain with a substance. If you learn how to do this consistently, then you can, without a single doubt, eat normally for the rest of your life. I hope this article has given you enough motivation to get started. The truth is that any belief can be changed, so don’t let the thought that you can’t stop eating so much block your progress. It’s just not true. If you want to learn how to control overeating forever, subscribe now to my newsletter below. I’ll give you all the tips you need to make effortless, permanent changes without therapy. If you want to progress much faster than you are, I can help you eliminate your emotional blocks within a few hours with personal attention. Please contact me to learn more about what I can do for you.